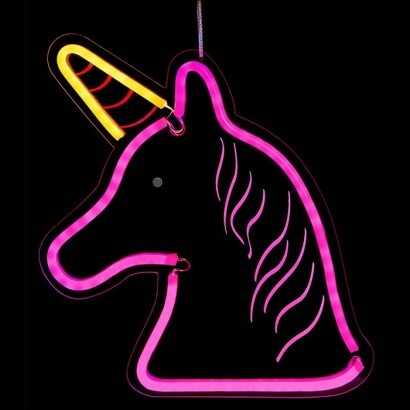 Super bright with vibrant colour, this enchanting neon unicorn light gives off funky retro vibes adding a touch of magic to your home. Made with LED neon flex, this beautiful unicorn light takes on a magic all of it's own in the dark, shining with a super bright outline just like the retro neon signs of the past. Mounted on clear perspex to compliment the neon effect, this retro styled light has a clear mains cable and a silver cable for easy placement.